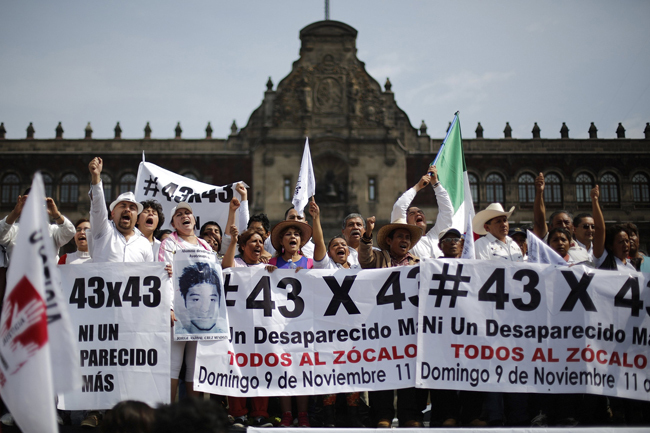 MEXICO CITY (CNS) — The Mexican bishops’ conference issued an impassioned plea for peace and an end to the bloodshed in a country consumed with the crisis of 43 teacher trainees allegedly captured by crooked cops, killed by organized crime and burned. “With sadness we recognize that the situation of the country has worsened” — since 2010, when the bishops published a pastoral letter on violence — “unleashing a true national crisis,” the bishops said Nov. 12 during their semiannual planning sessions in suburban Mexico City. “Many people live subjected to fear, finding themselves helpless against the threats of criminal groups and, in some cases, the regrettable corruption of the authorities. Ordinary Mexicans have taken to the streets, condemning the crimes committed against the students and the apparent collusion between criminals and the political class in parts of the country. The bishops lent their support to peaceful demonstrations, which often have been led by students, and called for a day of prayer Dec. 12, when millions of Mexicans celebrate the feast day of Our Lady of Guadalupe. “In our vision of faith, these acts make it evident that we have distanced ourselves from God,” the bishops said. “We join the generalized clamor for a Mexico in which the truth and justice provoke a deep transformation of the institutional, judicial and political order that assures that acts like these never repeat themselves,” the bishops said. The protests and outrage are among the strongest in recent years and reflect anger with the ongoing insecurity in the country. Many have adopted the slogan, “I’ve had enough,” echoing off-the-cuff comment of Mexico’s Attorney General Jesus Murillo Karam after a Nov. 7 news conference that has been interpreted by many as insensitive. Authorities arrested Jose Luis Abarca, mayor of Iguala, and his wife, Maria de los Angeles Pineda, Nov. 4 in Mexico City, alleging they ordered the attack on the students. The couple claimed the students were coming to protest a community event planned by Pineda. Classmates said the students went to Iguala, 120 miles south of Mexico City, to collect funds for a future trip to the capital, but had their borrowed buses shot at by police — who detained 43 of the teacher trainees and handed them over to members of the Guerreros Unidos gang. Murillo spelled out the details Nov. 7, saying three gang members confessed to burning the bodies in a garbage dump. Six bags of ashes and bones have been discovered at the site. Families of the missing students refuse to believe the government and said they only will accept evidence presented by Argentine forensic experts working on the case. Father Victor Manuel Aguilar, spokesman for the Diocese of Chilpancingo-Chilapa, where the students’ school is located, said the mistrust comes from an unhappy history of human rights abuses in Guerrero state, which is south of Mexico City and full of impoverished, indigenous communities that have been exploited and pushed to the society’s margins for centuries. “Justice is often delayed … if it arrives at all,” he said. The case has caused outrage and a political crisis for President Enrique Pena Nieto, who had stopped speaking on security matters in an attempt to improve the image of Mexico as an investment destination. “There has never been a rebuke like now,” Father Aguilar said. Pena Nieto — who has not visited Iguala or the students’ school since the tragedy, but departed for an overseas trip Nov. 8 — appears to have been caught flat-footed. He has proposed an all-party pact to curb crime and corruption. While not unlike the consensus he achieved to approve 11 structural reforms in areas such as education, energy and taxation, it has found tepid support. Catholic leaders have called for a change in Mexico, even though they are seen in some cities as part of the establishment — rubbing shoulders with prominent politicians and businessmen and staying silent on issues such as insecurity and corruption. Protests have continued, especially in Guerrero, where students and their supporters have burned government buildings, blocked highways and marched through the tourist zone of Acapulco. Father Aguilar sees the protests continuing as long as the students’ whereabouts remains uncertain.